This is an advertisement for Glen Spey Glenlivet whisky. 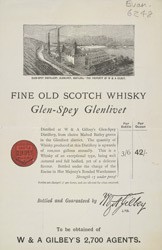 The Glen Spey distillery was founded in 1884 and was acquired by the Gilbey brothers who were wine merchants from London. They turned their interests towards distilling gin, bought a number of distilleries and were very successful. In 1962 Gilby’s merged with Unwin’s.